I crossed Bahia Cadiz this morning and am now in Rota, Spain. I published a number of posts that have gotten lost, once I get free Internet I will post them again. Expecting to only have one night at Marina Puerto America (30 euros) I got up early to head into town. On the way to get some breakfast I stopped in the office and was told I could stay for another day. This was a relief but I was still motivated to get into Cadiz and Roger's great cathedral tour. Cadiz is a very old town, founded by the Phoenicians over 3,000 years ago, settled by the Romans and Moors, attacked by Carthage and Hannibal, destroyed by the Visigoths, settled later by the Portuguese and in 1902 was the site of the signing of the first Spanish constitution. It is much smaller than I expected with a population of about 125,000 and a size of 12 square kilometers. Given that it is an island one would expect that it had not been overrun as much as it has been, each new conqueror just made the walls higher. I headed downtown - the marina is on the wrong end of the commercial port so it is about a 1 km walk to the town. I carried my camera and computer with me as I was informed that there were several free WiFi sites downtown. Short story I never found one that worked. The city has a very strong Moorish influence, the streets are very narrow. Everything is shuttered - the kind of thing you only see in bad neighborhoods in the US but is commonplace in Europe. As I was walking down one narrow street it struck me that back in the days of horses and chamber pots (emptied into the street) that this must have been some ripe city. I explored the cathedral, the public market (food) and wandered around unsuccessfully looking for WiFi. After a bit I decided to head to the Real Club Nautico de Cadiz, located next to the marina and reputed to have WiFi. They did but it was not working. 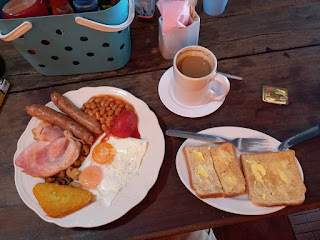 They do have a very nice restaurant that is open to the public so I relaxed and had a bit of lunch. Realizing it was still early in the day I unburdened myself of all the hardware and headed back into Cadiz to explore some more. Of course that was when I found a public Internet site that is reputed to have WiFi. I rented a terminal for 30 minutes (1 euro) and did my major notifications to my family that I am here safe. Heading back to Reboot I once again passed the commercial port that was quickly filling up with tall ships from the race. The signs all said that it would be open tomorrow (which is actually today as I write this.) Before I could go to work on the furler I was offered a beer. Then another beer. Then to come over to their boat. Then we had some wine. Snacked on Ham carved from a haunch. XO came to visit them. More beer, more wine. Great conversation. They are two Spanish sisters and their husbands (partners?) The one sister works at the Spanish consulate in Tangiers, the other couple live in Milan, Italy. The husband (T.K.) from Milan does ERP implantation consulting at the moment for Shell Oil. We had fun talking shop. They had rented the boat for a week of holiday. We talked a bit about the economy of Europe and in particular Spain, Portugal and Italy. They indicated that it is really bad with very high unemployment. Greece is apparently a huge mess. They all agreed that one of the biggest problems is political corruption. As the sun was setting (and so was I) I was told that this had just been the warm up and we needed to go down town for dinner. I was invited to come along, but XO had to go to bed. After all he is only 3. We hopped into two taxies and headed for the old and non-tourist part of town. We had a great dinner al fresco. I didn't order anything - we had about 4 different courses of local fish and some wonderful sweets for desert. I tried to contribute but was told that the evening was on them. What a treat. We then went in search of music and a nightcap (like I really needed a nightcap - we had continued to drink through dinner) and ended up back at the port. We discovered that the Talk Ships festival had opened. In we went. The ships were all docked but none were entertaining visitors. At the Italian ship Amerigo Vespucci there was a line of young men on the rail and a gaggle of young women on the shore. There was one "old salt" on the ship - perhaps 50 years old. I yelled up "I have seen this before." He said, "yes, that is why I am up here, it is safe." We had a good laugh. There was a concert going on at the far end of the pier - it broke up just as we arrived. What to do? My hosts said "more beer of course." We wandered around a bit more and then took a cab home. I have been granted another day in the marina, tomorrow I relocated to Rota at the North end of the bay. I expect to stop in the Navy base and then plan my trip to Gibraltar. Off to find a WiFi connection so I can send this and wander the tall ships festival. I take a certain amount of comfort in the fact that I have a transmit/receive AIS transponder. Not only can I see the other ships but they can also see me. Coastal Europe has far more ship traffic that I experienced traveling the coast of the North and Central America. As a general rule this is not a problem as the ships alter their course and go around me. I have stopped calling each individual ship as they all tell me "don't worry about it, we have you covered." Even so the AIS has a proximity alarm and if anyone gets within 2 miles of me the alarm goes off. This can be really annoying but, as you will see, a very good thing. I was just south of Sines, (N 37 09.254 W 009 17.871) early in the morning but daylight, 25 knot winds, 6 foot seas. The alarm goes off and I see MSC Maria Saveria heading at me. The closest point of approach (CPA) is 100 feet. I don't worry, everyone else would start turning and the CPA would open up. As they taught me many years ago you don't want CBDR (constant bearing decreasing range.) Well, for the next 5 minutes I am getting CBDR. So I get on the radio and call them. After 3 or 4 fruitless minutes trying to get them to talk to me I realize that they are really close. I jump up from the radio to the cockpit and there they are, A quick tack and I stall Reboot and then start heading the other way. They go steaming blissfully by. I doubt the bridge watch ever realized he almost ran me down. I will be sending a complaint to the owners, once I figure out their email. Feel free to send them one too, telling them their ship almost killed your friend. My first stop after checking in at the Cascais Marina office was the SkippeR restaurant. This turned out to be a real blessing. I was adopted by the staff. They feed me, not only from the menu but made some typical Portuguese dishes for me to try. The ladies in the kitchen also fed me after closing as I kept coming in very late at night. The staff also provided great advice on places to visit. I would never have gone to Sintra if it had not been for Nuno. Another benefit was that they had a good internet connection and were open late in the evening. This let me Skype back to the United States at a time when my friends were awake and not at work. We even had a visit from XO (who had to stay outside but was delighted to be off the boat and able to roll in the dirt in the flower bed. Then of course he had to clean himself for the next three hours. If you come to Cascais be sure to visit and tell them I sent you. Also, you can like them ("SkippeR Bar and Restaurant") on Facebook. To be fed well make friends with the cook! Every once in a while I believe you have to do nothing. Today was my day. Spent my first half day on shore in Cascais in depressurization and sleeping. 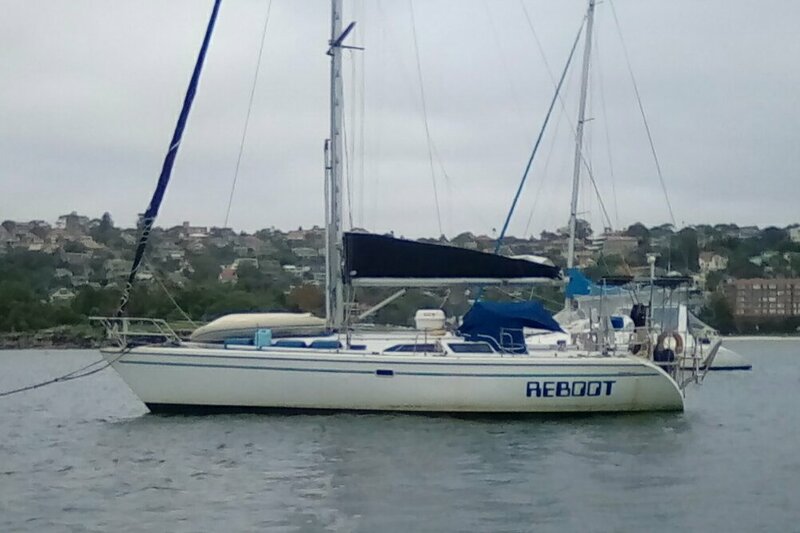 Reboot is at the dock at Marina de Cascais. Winds are still strong - hitting the high 20's in the marina. The marina is beautiful but also one of the most expensive in Portugal. It turns out that this is where the America's Cup race was held last year and the marina is truly "world class." The breakwall must be 15 feet high. There is a large central "technical area" and next to it a block of marina based industries (you know, bars,) OK, chandleries, sail makers, various mechanical technicians, etc. I spent most of the day walking around Cascais. This is a beautiful resort town. There are three beaches within walking distance of the marina. The actual downtown area is full of shops and restaurants almost all of which have outdoor dining. I have been adopted by the staff of SkippeR - a restaurant in the marina complex. Listening to them try to play heavy metal music and sing to it was painful. At least they didn't try to cover Door into Heaven. They were, however, a fun group. They had come from Lisbon by sailboat and although most were taking a bus back one intrepid group was sailing back to Lisbon (about 10 NM.) It turned out that they were docked in the next pontoon over from Reboot so I walked back with them and we talked about IDE's (Integrated Development Environments, their product) and sailing. A fun way to end the evening. 1. Light winds for the last 24 hours, mostly force 2 and 3. Wind shift since 0600 has moved wind from West to North. I have changed course from 041T to 90T to keep from having to run very close hauled as I have lots of East to go anyway. This is cost some in distance made good but will result in a much smoother ride. The wind is so light that I am having difficulty maintaining 90T, I am giving up northing. If I tack the winds are so light I give up both North and East. Ugh! 2. Mist this morning, 1005 overcast at noon, clouds slowly burning off. I have noticed in the entire trip that in one day I can go from clear to 100% overcast and back to clear again. 3. Got to talk to Spencer via phone patch last night, it was good to hear his voice. 4. Checked into the UK Maritime Net this morning. They apparently knew about me, probably because Nigel (who did a Chicago - Mac and Bayview Mac with me) is a frequent station heard. 5. Still difficult to get a radio link. The number of WINLINK stations in Europe is very small compared to the US and I am still quite a ways off the coast. 1. With the help of several people we got Reboot pulled out of the stack of 3 boats. This was made more difficult by the fact that there were three boat raft ups on either side. Just before we started the wind was very favorable to just be blown out, but of course the wind reversed as soon as I cast off. 2. Clawed, and I do mean clawed my way out of Horta. There was an adverse wind and current between Faial and Pico. When I would tack the current would push me back and give up almost all the northing I had made. Once I got out the wind shifted and I was able to get around Sao Jorge and Graciosa without further incident. I did have to run the engine the entire time as the winds were light to non-existant. 4. It is clear that we are no longer in the tropics. Average temperatures in the day are 65 to 70 degrees, at night 60 to 65. I am unpacking clothing I have not worn in a while.